BACKGROUND: At-risk women of advanced maternal age (AMA) can choose to have second-trimester invasive testing for a prenatal genetic diagnosis on the fetus. Being HIV-positive can complicate the decision-making process. OBJECTIVE: To document HIV status and prenatal genetic diagnosis choices in women of AMA attending genetic clinics in Johannesburg, South Africa, for counselling on the risks of abnormalities in their fetuses. METHODS: Data on the characteristics of the sample, HIV status and prenatal diagnosis decisions were collected retrospectively from the files of 350 women (>34 years) counselled for AMA in genetic clinics in Johannesburg and Pretoria. The time period was 6 months in 2003 and 6 months in 2004. A sample of the women (n=15) who were HIV-positive were interviewed and completed questionnaires on their understanding of their situation. The data were analysed and submitted to statistical testing. RESULTS: Of the 350 women, 183 (52.3%) were HIV-negative, 44 (12.6%) HIV-positive, and 123 (35.1%) of unknown status. Significantly more HIV-negative patients (79/183, 43.2%) than those who were HIV-positive (6/44, 13.6%) had amniocentesis performed for fetal diagnosis. Most of the interviewed women (12/15, 80.0%) understood the severity of HIV infection, 5 (33.3%) considered termination of pregnancy based on the transmission risk, and 4 (26.7%) would have requested amniocentesis and prenatal diagnosis if they had been HIV-negative. CONCLUSION: Decision-making regarding prenatal genetic diagnosis is influenced by HIV status among older women. Effective access to highly active antiretroviral therapy throughout pregnancy would make decision-making easier for these women. Women of advanced maternal age (AMA, >34 years old) are at an increased risk of having an infant with a chromosome abnormality, but only a minority of older South African women have access to genetic counselling and testing for such abnormalities during pregnancy. These women face difficult choices relating to their risks and options. AMA in itself may cause anxiety for women, but the HIV/AIDS pandemic in South Africa complicates their predicament. In the antenatal genetic counselling clinics held at three academic hospitals in Johannesburg, the percentage of pregnant women who are HIV-positive is increasing. For a pregnant HIV-positive woman to make fully informed decisions regarding her pregnancy and her reproductive choices, she needs to have a clear understanding of the impact of her HIV status on her own future health and that of her unborn infant. HIV is a retrovirus that is usually transmitted through sexual contact, but it can also be transmitted vertically from mother to child during pregnancy, at birth and through breastmilk. In developing countries, HIV is most commonly transmitted by heterosexual contact and by mother-to-child transmission (MTCT). The risk of MTCT depends on several factors, including maternal viral load and CD4 count, mode of parturition, and availability of antiretroviral treatment during pregnancy and delivery. The type and regimen of antiretroviral therapy (ART) also influences the transmission rate. Prenatal diagnosis has been available for older women at risk for chromosomal defects in their infants for several decades. Professor Trefor Jenkins was instrumental in initiating this service in Johannesburg at both the laboratory and genetic counselling levels. He subscribed to the philosophy of freedom of choice and informed decision making in this situation and supported couples in their decisions. The HIV epidemic brings in a new factor for the older at-risk woman who is HIV-positive, and this article reports on a study on this topic. South Africa, with only 0.7% of the global population, has 17% of the HIV/AIDS burden. As a result life expectancy has fallen from 62 years in 1992 to 50.5 years in 2007. However, it has been difficult to estimate the number of infected adults accurately. According to data extrapolated from antenatal surveys, the HIV prevalence rate rose from 1% in 1990 to 25% in 2000,[3,8] and population incidence estimates range between 10.4 and 14.2%. According to Dabis and Ekpini, the MTCT rate in Africa ranges from 25% to 45%, with transmission dependent on maternal viral load and length of breastfeeding. The higher the maternal viral load, the greater the risk of intra-uterine and intrapartum transmission. Worldwide, approximately 600 000 infants are infected with HIV via their mothers each year. The infection accounted for 7.7% of all deaths of under 5-year-olds in sub-Saharan Africa in 1999, compared with 2% in 1990. In Africa there is more rapid progression from HIV to AIDS than in industrialised countries, as a result of poor baseline health, poor nutrition and ill-equipped health services. The World Health Organization has suggested the following strategies to reduce MTCT: prevention of new infections in adults; prevention of unwanted pregnancies; prevention of MTCT; provision of antiretroviral treatment to pregnant women in the peripartum period and to the neonate; and provision of care and support to HIV- infected women, their infants and their families. Ideally pregnant women should be on a multi-drug regimen to lower the viral load, thereby reducing the risk of HIV transmission to the fetus. In developed countries the risk of MTCT has fallen from approximately 30% to less than 5% as a result of prevention strategies. This risk can be reduced to 1.2% when highly active antiretroviral therapy (HAART) is administered. In resource-constrained settings, inadequate finances and infrastructure may limit the practicality of implementing prevention programmes. However, the use of single-dose regimens may be worth considering because a 47% reduction in the 3-month transmission rate from mother to child was observed in the Ugandan HIVNET 012 trial, with only 13.1% of infants becoming HIV-positive. This treatment programme is viable and cost-effective, and because it is a once-off treatment at birth, adherence is good. Problems with this treatment may arise if HIV resistance to nevirapine occurs after the single dose. Older maternal age is associated with an increased risk of having an infant with a chromosome abnormality, especially trisomies, the most common being Down syndrome (DS), which occurred in about 2.1/1 000 (1/476) births in one South African rural area. Genetic counselling should be offered to all pregnant women of AMA, and age-related risks (which increase exponentially with age) of having a child with a chromosomal abnormality, as well as options for prenatal testing and selective termination of pregnancy if a fetal abnormality is detected, should be discussed. Decisions should be made according to the social circumstances and cultural and religious beliefs of the patient. In South Africa, pregnant women aged 35 years or older are considered to be of AMA, as recommended in the Department of Health Policy Guidelines, and 15.1% of women are in this category. The options for prenatal testing in any one referral hospital depend on the stage of the pregnancy and the practices of the hospital where the antenatal clinic is held. Chorionic villus sampling (CVS) is only available at Chris Hani Baragwanath Academic Hospital, Johannesburg, while amniocentesis for prenatal genetic testing is performed at all three academic hospitals in Johannesburg. Both techniques are invasive and carry a small risk of spontaneous abortion. This risk varies depending on the skill of the operator, but even with experience the risk of miscarriage after CVS is given as 1 -3%, and that after amniocentesis is 0.5 - 1%. The risk of having an infant with a chromosomal disorder associated with AMA is relatively low compared with the risk of HIV transmission from an infected mother to the infant when HAART is not available. Ignoring the risk of HIV transmission, which is as high as 30% without any antiretroviral treatment, and is 13.1% even with nevirapine treatment (given prior to birth, plus a dose given to the neonate shortly after birth), is incompatible with appropriate, logical and ethical patient care. A genetic condition with a risk of transmission as high as 13.1% and as poor a prognosis as HIV in infants would warrant the option of selective termination of pregnancy. Few studies examining the risk of MTCT associated with second-trimester amniocentesis have been conducted, but a fourfold increase in the third trimester has been documented by Tess et al. Another study showed that amniocentesis without antiretroviral cover resulted in an increase in the transmission rate. However, use of HAART appears to reduce the risk of MTCT during amniocentesis, and the viral load in the amniotic fluid was found to be undetectable in women using this therapy, even when it was detectable in maternal blood. It is therefore inferred from these studies that second-trimester amniocentesis carries an inherent risk of vertical transmission from mother to fetus, but the exact risk is not known. As HIV is present in the amniotic fluid of untreated infected women, it would be unethical to offer an HIV-positive woman a second-trimester amniocentesis without informing her of the transmission risks. Raising anxiety about HIV infection alters the structure, nature and outcome of the genetic counselling session. The counsellee is faced with negative information, and it may be difficult for her to consider her prenatal diagnosis options optimally. She may need time to internalise the information, and then her interpretation of the information needs to be explored, with issues of social isolation, stigmatisation and low self-worth being dealt with before she makes decisions. To investigate, in pregnant women of AMA who had been tested for HIV status, the following: the uptake of amniocentesis for prenatal genetic diagnosis; the choices made regarding fetal genetic testing and termination of pregnancy; knowledge of maternal-infant HIV transmission; and perceptions of the impact of their HIV status on their decision-making. The setting of the study was the genetic counselling clinics at three Johannesburg academic hospitals, Johannesburg Hospital (now called Charlotte Maxeke Johannesburg Academic Hospital), Coronation Hospital (now Rahima Moosa Mother and Child Hospital) and Chris Hani Baragwanath Academic Hospital, one Pretoria academic hospital (Kalafong), and one private hospital in Johannesburg (Donald Gordon Medical Centre). All the participating women were drawn from the patients attending these hospitals. There were two parts to this study. The first involved documenting (retrospectively) and comparing over two 6-month periods (February - July 2003 and February - July 2004) data on the numbers of pregnant women counselled for AMA (>34 years) and their ages, HIV status, and decisions regarding prenatal genetic testing. The second part, involving interviews with HIV-positive pregnant women during the second time period, investigated their knowledge regarding MTCT and their prenatal diagnosis decisions. Records for all the women who attended the genetic counselling clinics over the two 6-month periods were sought in the filing system of the Division of Human Genetics, National Health Laboratory Service (NHLS) and University of the Witwatersrand, and 350 files were found. In the 2003 sample, 169 women were counselled, an average of 28 per month, and in the 2004 sample, 181 women were seen, averaging 30 per month. The majority of women (343/350, 98.0%) were seen at the three academic hospitals in Johannesburg. The remaining 7 women (2.0%) were either from Kalafong Hospital or the Donald Gordon Medical Centre. The following details were collected (using a check-list compiled by the first author, JSB): date of birth, occupation, address, marital status, parity, obstetric and family history, clinic attended, date of ultrasound examination, duration of pregnancy, HIV status, decisions surrounding amniocentesis and termination of pregnancy, and notes made by the counsellor on the counselling session. This information was documented in an Excel spreadsheet. The research instrument for the 2004 interview sample was a schedule of questions developed by one of the authors (JSB) in consultation with a clinical geneticist (ALC). This schedule comprised 14 questions investigating the participants' attitudes and knowledge regarding AMA and chromosome abnormalities; HIV, HIV testing and MTCT in pregnancy; and the options of prenatal genetic testing and termination of pregnancy, based on the fetal abnormalities and/ or the MTCT risk. Interviews were conducted by the doctors and genetic counsellors of the Division of Human Genetics, NHLS, and the completed schedules were given to the researcher (JSB). The data from the completed check-lists and questionnaires were analysed to provide the results of the study. Stata Release version 8 and Fisher's exact test were used to undertake the statistical analysis. All tests were two-tailed, and p-values of <0.05 were considered significant. Ethics approval for the project was granted by the Committee for Research on Human Subjects of the University of the Witwatersrand on 29 January 2004. The subjects were pregnant women of AMA, residing in the urban areas of Johannesburg. They were from various educational and socioeconomic backgrounds. The majority of patients were black Africans, but there were also a few patients of mixed ancestry and of Caucasian origin. The biggest single group of women (59.4%, 173/350) were at 16 - 20 weeks' gestation at the time of ascertainment (range 10 - 24 weeks). HIV testing was carried out at the antenatal clinics, but results were available for only 31.4% of the patients (Table 1). Altogether 110/350 (31.4%) women chose to have prenatal genetic testing. However, a significantly greater number of women aged 40 years and older (43/107, 40.2%) had testing compared with those aged between 35 and 39 years (67/243, 27.6%) (p=0.024). There was a statistically significant increase in the number of patients whose HIV status was known in 2004 compared with those seen in 2003 (p=0.01). Of the 169 women counselled in 2003, the HIV status was known for 98 (58%), while in the 2004 group, the HIV status of 129/181 women (71.3%) was known. The results of HIV testing are shown in Table 2. Although the HIV status of more women was known in the 6 months of 2004 compared with the 6 months of 2003, there was no statistically significant increase in the number of women who tested HIV-positive in the 2003 group (15/98, 15.3%) compared with the 2004 group (29/129, 22.5%) (p=0.235). Combining the data from both 6-month study groups, 79/183 HIV-negative women (43.2%) and 6/44 HIV-positive women (13.6%) chose to have prenatal testing (Table 3). There was therefore a highly significant difference in uptake of amniocentesis, with the HIV-negative women more likely to have prenatal diagnosis for chromosome analysis than the HIV-positive women (p<0.001). A total of 110 amniocenteses were performed (31.4%), and 25 (22.7%) of these were on women of unknown HIV status. No significant difference could be established between uptake of amniocentesis when the genetic counselling was provided by a medical geneticist (uptake 21/55, 38.2%) or a genetic counsellor/ genetic nurse (uptake 89/206, 43.2%) (p=0.269). In the second part of the study, a sub-sample of the participants in the 2004 sample who were HIV-positive (29/181, 16%) were invited to participate in interviews. Altogether 29 women were approached and 15 (51.7%) participated. Reasons for non-participation included fear of disclosure, leaving the clinic before the session was completed, and lack of available translators. Since this sample was small, the results only suggest trends. Most of the women (12/15, 80%) stated that their pregnancy was unplanned, and few (3/15, 20%) were aware of their age-related risks. Also, a small group of women (3/15, 20%) said that they had not been counselled regarding the risks of MTCT. However, 12/15 women (80%) reported being advised concerning avoidance of breastfeeding. Ten women (67%) remembered being told about the value of taking nevirapine at the onset of labour, but not all the women clearly understood how this affected the infant's risk of infection and only half (8/15, 53.3%) knew that a risk of the child being infected remained, but that it was reduced. Four women (26.7%) thought that there was no risk of MTCT when nevirapine was used perinatally, and 3 others had misunderstood the use of nevirapine. Nine of the women (60%) stated that they had told their partners about their HIV-positive status, and 5 (33.3%) said that their partners had also been tested. 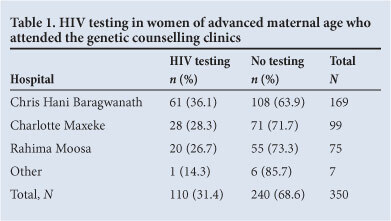 With regard to prenatal genetic testing, decisions varied: 4 women (26.7%) said that they would have requested testing if they had not been HIV-positive, 2 (13.3%) would have requested it if antiretroviral cover was readily provided, and 3 (20%) said they would have requested testing regardless of HIV status or availability of antiretroviral prophylaxis. However, 5 women (33.3%) said they would not have wanted testing even if they had been HIV-negative. One woman (6.7%) requested termination of pregnancy (without testing) and was referred to the gynaecology outpatients department for further management. Pregnant women who are HIV-positive have the option of selective termination of pregnancy up to 20 weeks' gestation, because of the risk of MTCT during pregnancy and birth. Eight (53.3%) of the 15 women said that they had been advised about this risk, but only 2 (13.3%) remembered being told about the option of termination. Of the 15 women, 5 (33.3%) said they would consider termination, 6 (40%) said they would not consider this option, and 4 (26.7%) were too far advanced in their pregnancies to be offered the procedure. Of the 10 women (66.7%) who were either too late to be offered termination or who refused it, 5 (50%) did not properly understand the risk of MTCT. In a 2003 South African survey the prevalence of HIV was 198/1 000 (19.8%) in women aged 35 - 39 years and 172/1 000 (17.2%) in women aged over 40 years. The prevalence in the present study corresponds with these findings. There was a statistically significant association (p<0.001) between HIV status and amniocentesis uptake, and HIV-positive status appeared to play a role in deterring older women from undergoing prenatal testing. The risk of MTCT associated with invasive testing is therefore a significant factor in decision-making regarding prenatal genetic testing in older women. However, other factors may have included the characteristics of the women, such as age-related issues (more of the older than the younger AMA women could have been HIV-positive, although this is somewhat unlikely), as well as the associated DS risks. Other factors identified in South African studies that may influence the uptake or rejection of prenatal testing include religious convictions, poor obstetric history, fear that the procedure will result in miscarriage, and a limited understanding of the implications of a diagnosis of DS. In Australia, women in public sector hospitals, who are generally of low socioeconomic status, are less likely to have amniocentesis than those in private hospitals, suggesting that the former group may be less empowered to make decisions. The fact that the older women (>39 years of age) in the present study requested prenatal testing significantly more often than the younger women (35 - 39 years) suggests that the women appeared to have an appropriate understanding of their age-related risks. Similarly, those counselled about the risk of MTCT acted according to their risk status. Prophylactic treatment for HIV-positive pregnant women undergoing second-trimester amniocentesis was better established in 2004 than in 2003. Nevertheless, 2 (13.3%) of the 15 women participating in the interviews said that they would have considered amniocentesis if antiretroviral cover was readily provided, suggesting that some patients were not confident that the service would be available. From April 2013 South Africa adopted HAART for all HIV-positive pregnant women, regardless of CD4 count, as official policy. This development may lead to an increase in the uptake of amniocentesis in future. Only 2 (13.3%) of the interviewed women remembered being told about the option of pregnancy termination based on the risk of MTCT, although at the time it was antenatal clinic policy to offer this procedure to HIV-positive pregnant women up to 20 weeks' gestation. In practice, termination may only be offered to at-risk women at <12 weeks' gestation (personal communication, Dr R Adams, 2013), and most of the women in the present study were more advanced. Other reasons for this reported lack of knowledge are not clear. However, women who have just been informed that they are HIV-positive may be overwhelmed by the result, and may not assimilate all the information offered. In addition, HIV counsellors and antenatal clinic nurses may not be fully informed about this option, or they may have personal and moral objections to termination and therefore refrain from discussing it with the patient. In the small sample interviewed, 5 women (33.3%) considered termination of pregnancy, based on MTCT, after genetic counselling, but only 1 patient in the 2003 group, and another in 2004, requested the procedure. When the risk of HIV transmission to the fetus with and without perinatal antiretroviral prophylaxis was discussed in the interviews, a third of the women did not have a proper understanding of transmission of the virus. Unless women are very clear about the risks of HIV transmission to the fetus, they are not able to make fully informed decisions on termination or prenatal diagnosis, or to act appropriately. However, the health education process involves a level of health literacy, and the concepts are traditionally difficult to convey in the setting of prenatal genetic testing. Furthermore, the study was conducted at a time of official denialism, stigmatisation of affected people, and limited public understanding about the nature and transmission of the virus (these factors may also have contributed to the relatively low uptake of HIV testing among the patients in the present study). Now that the condition is more openly acknowledged and managed, the situation should be different. Initially nevirapine was usually given before amniocentesis, although a standard policy was not in place during the study period at any of the hospitals where genetic counselling took place. There is some uncertainty regarding the risk of drug resistance after administration of a single dose, and the consequent effectiveness of perinatal nevirapine prophylaxis to reduce MTCT. Different policies for ART in pregnancy therefore existed at the three academic hospitals where genetic counselling was offered. Although this study was carried out some years ago, when the management of HIV was somewhat different, it throws light on what can happen in under-resourced settings and provides a baseline from which to assess women's understanding of MTCT and risks to the fetus, as well as the factors involved in their attitudes to genetic testing and prenatal diagnosis. This study showed that HIV-positive older women (>34 years) were significantly less likely to accept prenatal testing for chromosome abnormalities than women of the same age who were HIV-negative. Also, older women (>39 years) in the AMA group were significantly more likely to request amniocentesis than younger women (35 -39 years) in this group. The small sample of women interviewed in the present study perceived the impact of their HIV status as serious for themselves and their infants. Several knew of the MTCT risk, and that ART is required before amniocentesis. These trends were observed, but need to be confirmed by further studies with larger samples and after effective HAART programmes for all affected pregnant women have been introduced. It can, however, be inferred from the data that although the HIV-positive AMA women were aware of the seriousness of HIV, many were unaware of the option of termination of pregnancy for the MTCT risk, and of those few who considered termination, very few requested the procedure. The risk of a child having a chromosome abnormality ranges from 0.5% (35-year-old mother) to 12.5% (49-year-old mother). These risks cannot be presented in isolation, while disregarding the greater risks and serious implications of HIV infection, in a South African setting. This approach does not suggest that AMA counselling be neglected, as the risks remain significant. It is therefore important that the new policy of offering HAART to all HIV-positive pregnant women is effectively implemented, so that the risk of MTCT during invasive testing is reduced and decision-making for older women in this situation simplified. Some non-invasive first-trimester combination screening for prenatal diagnosis, and refining of DS risks based on the results, is offered in a few South African hospitals. These procedures are not available to the majority of women at risk, and will probably not be for some time to come, as they are costly and the logistics are complex. These women will therefore probably continue to use the second-trimester amniocentesis service and continue to be given age-related risks only. However, infant mortality rates have recently fallen dramatically in the Western Cape Province of South Africa as a result of the introduction of an effective MTCT prevention programme. If the risks of vertical transmission of HIV from mother to child can be reduced throughout the country, if these risks become less significant than the risks associated with increasing maternal age, and if in the future first-trimester screening could be offered to women of all ages (as is recommended in the Netherlands) so that the DS risks can be refined, invasive testing for chromosome abnormalities will become a more viable and relatively safe option for women who are HIV-positive, of AMA and at increased risk. The willing cooperation of the women who participated in the interviews, the University of the Witwatersrand bursary provided for JSB, and the support of the Mellon Foundation for JGRK are acknowledged.